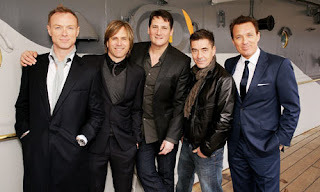 As promised back in March, London's fave 1980s new romantic scenesters, Spandau Ballet are back! Their much awaited reunion tour kicked off this week in Dublin to much fanfare. Sure, the guys are a little larger around the middle and more crinkley around the temples but apparently, if you closed your eyes the songs were just as poppy, catchy and memorable as they were back in 1983. Surprisingly though, sax player Steve Norman *still* has hair! After all that bleach, tinting his hair to a dangerous shade of white...the man must have hair follicles of steel! Back in the day I was a Durannie first and foremost so admitting to liking Spandau was akin to being disloyal to Simon, John and co., but I'm a little more mature now (*ahem! *) and I can admit that yes, I did own a few of their albums and they weren't half bad. And if they did tour Canada on their current reunion celebration, I would be there most definitely. With age comes wisdom and the strength to accept that there's more to life than Duran Duran (kinda!). Spandau Ballet's first new album in a kajillion years, "Once More" is out on October 19.